By now you all know that one of our most ardent champions of truth, justice and liberty has been suspended temporarily from her show on Fox News Saturdays at 9:00 p.m. I’m speaking about Judge Jeanine Pirro. 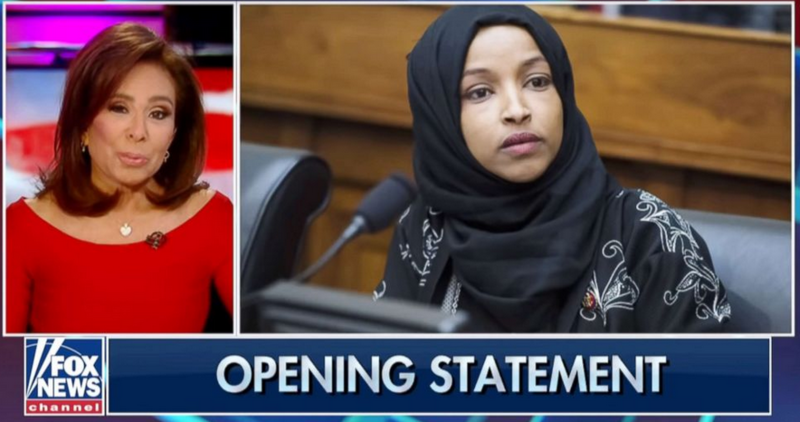 She is being reprimanded for using her First Amendment right of free speech representing millions of We the People on the issue of anti-Semitism openly shown by Congresswoman Omar. It is obvious that the opposition are powerful people. CAIR and The Muslim Brotherhood might be involved. Would not surprise us. But this is the United States of America not the Middle East, and we must protest Fox News cowardice in failing to defend one of their very best. My urgent suggestion is that you write to any management person at Fox and let them know that they will lose their viewers if they keep intimidating and silencing their “Truthful Opinion Hosts” and siding with anti-Semitic hate speakers. If we do not protest this injustice, they will soon go after other favorite Fox News people that speak for us and Fox will join CNN, NBC, ABC, and the rest of the fake news Media. At that point we will all stop watching Fox News.